Louise Kohrman is an artist and printmaker who lives and works in Western Massachusetts. 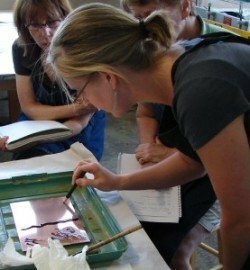 She received an MFA in Printmaking from the Rhode Island School of Design, a collegiate teaching certificate from Brown University, a BA in studio art from Smith College and has completed a printmaking and book arts program in Italy through the University of Georgia. She has worked as a printer at Wingate Studio in New Hampshire, working with artists such as Walton Ford, Aaron Noble, Benny Andrews, and printing the work of Louise Bourgeois, among others. Her work has been exhibited nationally and internationally and is collected in corporate, private, and public collections. She has shown at the International Print Center New York (NYC, NY), Gallery 808 (Boston, MA), RISD Museum (Providence, RI), Planthouse (NYC, NY), APE Arts (Northampton, MA), Bromfield Gallery (Boston, MA), the University Museum of Contemporary Art (Amherst, MA), Projects Gallery (Philadelphia, PA), Rose Contemporary Gallery (Portland, ME), New Hampshire Institute of the Arts (Manchester, NH), Lorg Fine Art Printmakers (Galway, Ireland), Wharepuke Print Studio (Kerikeri, New Zealand), Gallery Hasta (Hyderabad, India), among others. Her work is represented by the Flat File Gallery at Zea Mays Printmaking and by Cynthia-Reeves. Louise Kohrman’s studio practice focuses on etching and printed installation. Delicacy, intricacy, and attention to detail serve as foundations of the work. Through meditative processes, subtle colors and luminous materials, she creates works that explore pattern, repetition and multiplicity. Recent work plays with ideas of obsession, accumulation and dispersion. She is on the faculty at Zea Mays Printmaking, a studio, workshop, gallery, educational facility and research center dedicated to sustainable and less toxic printmaking practices. She teaches and demonstrates printmaking at art centers nationally. She sometimes works as a part-time Critic at the Rhode Island School of Design in the printmaking department. I have worked extensively in various printmaking techniques and have been teaching printmaking and related methods since 2002. My dedication to less-toxic printmaking equips me to provide in-depth technical instruction on many “green” intaglio processes such as hard ground, soft ground, non-acid techniques (drypoint), lift grounds, aquatint and etching in Ferric Chloride. I also provide instruction in chine colle and related techniques (mounting, collage, printing on or working with Asian papers), technical troubleshooting and professional printing methods. I enjoy working with artists on image and concept development through critique, discussion, goal setting and assignments, if desired. I especially find satisfaction in working critically with an artist on the content, concepts, visual elements and expression of their work and melding it with the process and technical process that informs it. As both a teacher and mentor, I feel that my role is one of facilitator and guide. Whether you are completely new to the process or an advanced practitioner, I like to encourage new ways of thinking while introducing traditional and innovative techniques, histories and concepts. I encourage self-criticism and gently push mentees further through experimentation to find their own voice and self-confidence as they develop their work. I feel that the development of one’s creative voice goes hand in hand with the development of technical skills. I shape our time together to the needs and goals of the mentee and pride myself in offering a supportive learning environment, an open dialogue and patient teaching style. I view the mentor-mentee relationship as a collaborative relationship, and value the lessons I learn in the process.